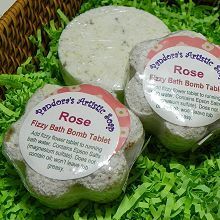 Learn how to make bath bombs, bath fizzies, and bath salts at the Soapmaking Studio in San Diego County, California. Learn how to create active treats for the tub. Students learn the secrets of making exceptional bath bombs, bath fizzy tablets, and bath salts. While most easy recipes include the simple process of creating bath fizzies using saturated fats as a sealer to prevent reaction to air, this Bath Bomb Class includes the advanced technique necessary to create bath fizzies without oils, so they won't leave a dangerously greasy bathtub the way oils do. 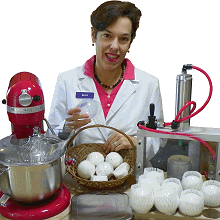 In order to formulate and make no fail bath bombs, this new course includes an explanation of the chemistry of the bath bomb reaction occurring between the starting reactants and the chemistry of the products yielded from the reaction. Students take home bath treats made in class. Attend in person or online.